Is Ripple—the enterprise software solution provider, slowly laying tracks for Convergence? From the look of things, that might be the end goal confirming what Jim Chauncey-Kelly, the Director of Talents Acquisition at Ripple, said in an interview as the reason why the company was beefing up, hiring engineering in the first half of the year. Convergence is a solution that rolls up xVia—an API solution, xRapid—a payment access that make use of XRP and xCurrent—an enterprise software solution that enable banks to instantly settle cross-border payments with end-to-end tracking. Remember, before xCurrent upgrade to version 4, Ripple did change their homepage layout. Earlier, Ripple did merge xVia, xCurrent and xRapid—which by the way is in use by four companies helping moving funds seamlessly between Mexico, US and Europe—under “Global Payments” in their homepage fueling speculations that Convergence would be a reality by the end of the year. Despite the excitement, banks are slow to upgrade. American Express and Santander are the only ones but are yet to incorporate xRapid even though Brad Garlinghouse is optimistic that “major banks” will integrate with xRapid by end year. There is a market-boosting, across the board recovery and several digital assets are back to green after 14 days of draw down. At spot prices, XRP/USD is up seven percent in the last day but still down 14 percent in the last week. This pullback from 35 cents is slowly reaffirming our previous bullish stance. As long as XRP/USD is trending inside the 35 cents-40 cents support zone, we might as well see prints towards and above Oct highs. 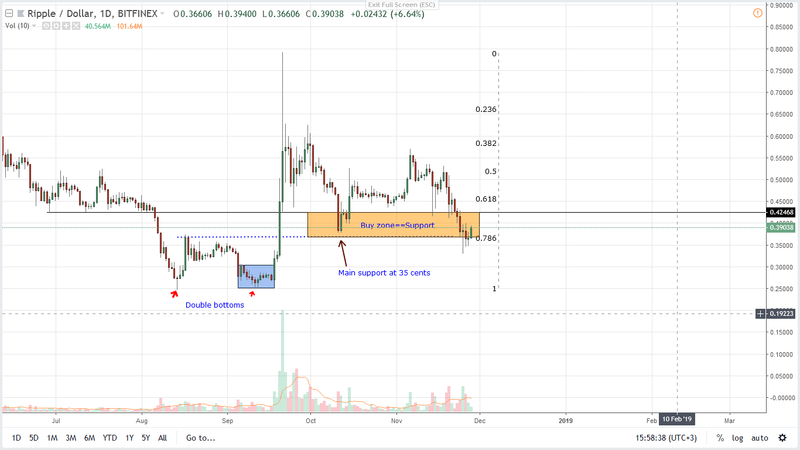 Like in previous XRP/USD trade plans, we shall retain a bullish outlook since prices didn’t sink below 35 cents—the lower limit of our support zone. From candlestick arrangement, it is clear that bulls are in charge. That not all prices are ranging within a tight 20 cents with resistance at 60 cents. As long as prices range, buyers have an upper hand. Because of this, conservative traders shall initiate positions once there is convincing breakout above 60 cents or drops below 35 cents. Aside from bars identified in previous XRP/USD analysis, Nov 25 bar is a stand out. Note that though the market is free-falling, Nov 25 did print a pin bar right off the main support line at 35 cents. What’s more, volumes were above average—at 182 million versus 92 million and interestingly, prices have been accumulating inside this bar and bulls are yet to completely close above its highs of 40 cents. Clearly, Sep 2018 surges did lead to price breaks above multiple resistance levels. That was a clear bull breakout. Though the confirmation wasn’t as strong, we expect a follow through three months after the trend defining upsurge of Sep. In our case, prices are bouncing off the base of the bull flag and traders can initiate two positions—once above 40 cents and later 60 cents—depending on their risk appetite. Technically, XRP bulls were and continue to be in charge despite attempts of lower lows. After today’s revival set in place by Nov 25 pin bar, we expect buyers to drive prices above 40 cents triggering short term longs with targets at 60 cents. Thereafter—assuming there is a solid close above Oct—Nov highs, conservative traders can buy on pullbacks in lower time frames with first targets at parity and $1.65. The post Ripple Price Analysis: XRP/USD Snap Back to Trend as Convergence Take Shape appeared first on Ethereum World News.